You Me At Six have become friends with James Arthur. 'The X Factor' 2012 winner was banned from singing their songs on the show because his mentor Nicole Scherzinger thought viewers wouldn't have heard of them, but the band have now struck up a friendship with the singer. 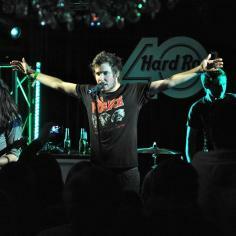 Frontman Josh Franceschi told the Daily Star newspaper: ''I got to know James because he has the same vocal coach as me. ''Me and our drummer Dan Flint were out with James and some other X Factor singers one night. A few of them are You Me At Six fans too. The band - also made up of Max Helyer, Chris Miller, Matt Barnes and Dan Flint - say there's no hard feelings and they are heading for number one this weekend with their fourth studio album 'Cavalier Youth'. The lads are also preparing to head out on tour in March and claim they've curbed their partying ways. Josh said: ''When we started we literally drank our way around the world thinking it was our duty to down all the free alcohol put in front of us. ''But the bands who last are those who are able to develop business heads. Josh insists they are not as angry as they used to be and their next album is the more positive than previous offerings. He explained: ''It's going to be great to throw my body around to the new songs, even though my back is f***ed.